Keep the blinds closed – Pop quiz! How much exterior heat would you say comes from windows? If you guessed 30 percent, you are correct. That’s why it’s a good idea to use shades and curtains whenever possible. Doing so helps you save up to 7 percent on bills and lower indoor temperature by up to 20 degrees. Don’t let this be another summer where your home feels like a sauna just because you’re reluctant to keep the blinds closed from time to time. Switch out the bed sheets – If you haven’t swapped out the sheets from winter, then now is the time. While flannel and fleece help you stay warm, cotton is the better choice for spring and summer. Keep in mind that staying cool at night allows you to breathe easier and, hopefully, sleep better. Set ceiling fans to rotate counter-clockwise – Wouldn’t it be nice to create a wind-chill breeze effect in your home on hot days? You can make it happen by adjusting any ceiling fans to rotate counter-clockwise. This is an ideal cost-effective alternative to cranking the air conditioner all day long. Focus on your body temperature – Some of us are absolutely miserable when the temperature gets above 80 degrees. By cooling yourself from the inside out, you don’t have to worry so much about the temperature in your home. We recommend trying everything from sipping ice water and applying cold cloths to making smarter clothing choices. Doing so can make a huge difference in keeping cool. Open the windows at night – This might be the oldest trick in the books. But it works! By cracking the windows before bedtime, you make the most of these cooler summer hours. Just don’t forget to close the windows in the morning before it gets too hot. Contact someone for air conditioning repair – Have you put off AC repair the last few summers and suffered? At Allegiance Heating & Cooling, it’s our belief that your home is your castle. 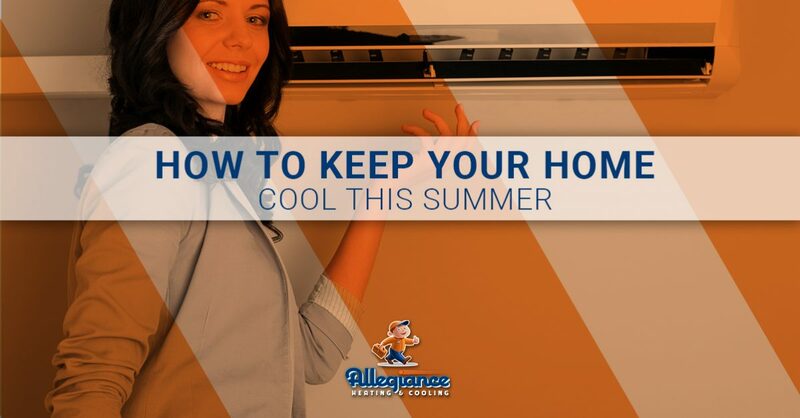 We want to help you get the most out of your HVAC system this summer. That’s we offer hassle-free air conditioning service at a price that won’t break the bank. Here at Allegiance, we aren’t like other HVAC technicians who barely give customers the time of day. You can count on us to arrive promptly, perform high-quality work, and treat you and your family with the utmost respect. Why turn anywhere else for air conditioning repair service? See what our Mokena HVAC contractors can do for you this spring/summer. Call now to ask about emergency air conditioning service.